me — he said, she said. That girl who at age 7 was frequently found busying herself washing her barbies' hair in preparation for their big day. 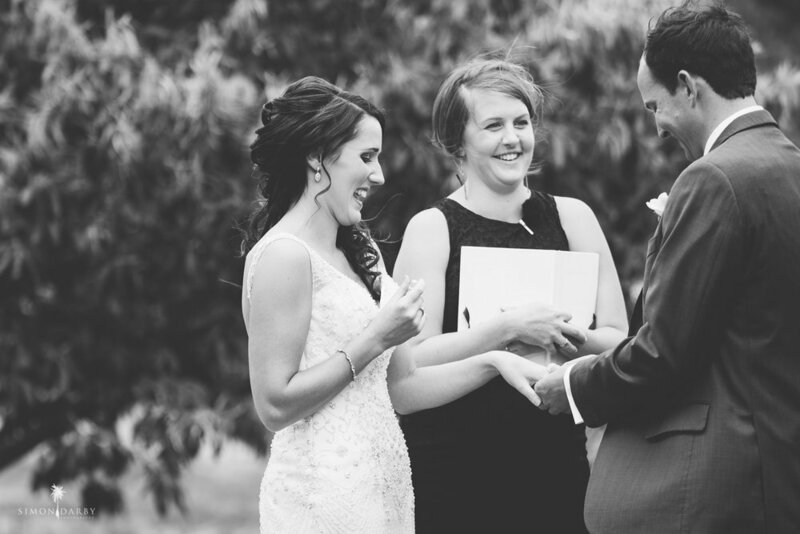 The girl who now at 30-something can always be found with a tissue in hand at a wedding, shedding a tear as the happy couple share their idea of forever with their favourite humans. I LOVE weddings. I love the way a wedding gives you a glimpse into the secret life that two people share. I love the way weddings make all the old married couples in the crowd sneakily hold hands and reminisce about the good times. I love the vows. I love the stories. I LOVE that in New Zealand you have the freedom to shape your wedding into whatever you want it to be. There is literally one line that needs to be said for the whole shebang to be legal - the rest is up to you. And me, if you'll have me along for the ride. I love a good laugh, I try not to take life too seriously, and when I'm not marrying ALL the people I'm happiest pootling about in my love nest with my husband and the tiny humans our love made. If all of this sounds like a bit of you, click the 'enquire' button top right to drop me a cheeky hello and tell me a bit more about you and the life you have planned. LET'S TELL A GREAT STORY.